Information from a 2017 study published in the Current Medical Research and Opinion journal about Asthma and the risk of early herniated intervertebral disc disease. The authors concluded that young individuals with asthma are at considerable risk for early disc disease and disc herniation in the neck and back. Herniated discs is commonly seen with degenerative conditions of the neck and back. A disc can bulge or herniate in the spine causing localized pain as well as radiating pain. Pressure and irritation cause the pain and it is usually seen as we age causing various pain and disability problems. It is often seen in 40% of young adults under 30, and more than 90% of 55 year olds. Considered to be an inevitable form of arthritis related to age and daily or work activities, much is now known regarding the processes and variations of this often complex disease. Early onset can be due to an acute inflammatory process like Modic 1 disc degeneration, injury, and genetic factors. In some, shrinking and narrowing of the spine causes a condition known as spinal stenosis, a leading cause of neck and back pain, disability, and spinal surgery. Now we are finding asthma to be another link in the puzzle to the physical and emotional pain that has followed mankind throug the ages. 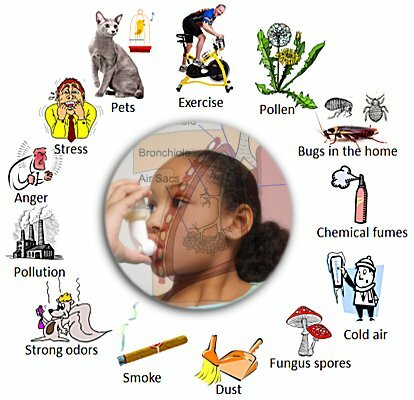 Asthma is chronic inflammatory disorder of the respiratory. The lungs become inflamed and constricted making it difficult to breathe, causing wheezing and coughing. Just like disc disease, factors associated with acute and chronic problems are related to environmental and genetic influences. In some, it is associated with cardiovascular disorders, diabetes, headaches, infections and emotional disorders. This is also seen in disc disease. The focus of the study was young adults the researches noted many inflammatory factors between early disc disease and young asthma, and saw a significant risk of early disc disease in asthma patients. The authors, after reviewing literature on over 47,000 patients, clearly demonstrated young individuals with asthma experienced a much higher risk of early onset disc disease, especially the neck and in 13 to 18 year old females. In the disc, inflammation causes an imbalance in chemicals which lead of the destruction of the foundation. The authors speculate that asthma, a chronic systemic inflammatory disease, can stress tissues, damaging to the musculoskeletal system, like the spinal discs. In both asthma and disc disease, there are an increase in inflammation related chemicals detected throughout the body. Since there are a long-term, high level of inflammatory chemicals associated with some asthma patients, this chronic exposure may harm connective tissue as is seen in destructive disc disease. Genetically, there are indications that there may be a high degree of family related predisposition for disc disease. There is an association between certain genes in disc disease that are also directly associated with asthma. Genes related to inflammation will be a target for therapeutic treatments in a number of diseases. Coughing seen in asthma suddenly increases the pressure in the spinal discs. This along with abrupt motions of the head and neck, almost whiplash like, may explain the higher incidence disc herniations seen in the neck or cervical spine compared to the lower back or lumbar spine. Better understanding of the inflammatory process and genetics in the role of asthma and disc diseases are needed. There are many other physiological, physical and environmental factors as well. This is affecting our children now, and awareness in ergonomics, posture, and undue stress like way too heavy backpacks are essential in addressing problems immediately. Parents and educators alike can play an important part in helping reduce the impact of future suffering for our young population. The findings of an association between asthma and early onset spinal problems in children and adolescents is one that should be taken seriously. While research for the future is essential, advances already seen in technology can be realized now.